Dear Hearts and Gentle People – It’s a cold day in the old hometown. Yesterday, however, the temp climbed to near 60. I spent time outside cleaning up the yard and washing my sun porch windows. Turns out they are not opaque after all. Who knew. Local news: lots of activity on the Auditorium front. The effort to save The Lex is chugging along, recent $500,000 matching goal met, and the abatement of asbestos and lead is complete. Air quality was immediately improved. Next: work to satisfy all ADA requirements. There is a monthly eNewsletter, if you would like to subscribe. Please send me your request, skworth@cebridge.net. We are also willing to snail mail the newsletters, but a request for that must be submitted too since it is more costly. The city is looking into a nationwide program called the Main Street Connection, which targets downtown revitalization. This fits well with the arts development program through Mizzou which is currently working to stimulate tourism. In the works now is a recorded tour of the town, and fabulous walking/driving tour brochures are already available. Before I begin with the correspondence, I have a message from the Gueguen family. Big brother Jack gave everyone a scare with his heart misbehaving. Surgery was not deemed necessary, however. Sister Mary Pat ’58 Gueguen Miller said: If anyone would want to send him a note, Westpine Study Center would be the place where it would be passed on: 100 E. Essex, Kirkwood, MO. 63122. If you wonder how I’m doing, for someone who walked all over, it’s quite a change not to be able to walk, even with a walker. How else to get around the house?—by means of a transport chair and stair lifts. To reinforce my fellow residents, two men from a home health care service take turns assisting me 60 hours a week, including weekends. I can get down to the chapel, to the dining room, and to my office next door to the bedroom where I try to keep up with 800 “particular” friends, as someone called you today, and do some reading. The library-archive is now located at the Thomas [Aquinas] International Center (ticenter.net) in Raleigh, which carries on a vigorous program of lectures and other presentations at the three universities in the “triangle.” I keep up my interest in the department at ISU, which awards a Thomas More scholarship annually; since retirement in 1996, the More Scholars number 16 bright young men and women in law, public service, and teaching careers. The ISU Foundation is still receiving contributions for the fund. “Second Childhood” sometimes seems more like “second babyhood.” But even after losing most of my mobility, I’m happy to be here accepting whatever may come. What a fun, interesting TLC. The moment I read that this Dennis Whitehead needed photos ID'd, I thought, "If Jim O'Malley doesn't know these people, nobody does." He has the most incredible memory of us all. We moved to Lexington from Marshall in June of 1941, so I don't know any of these kids by photo, really. But it occurred to me during it all that our TLCs should include all the photos we can muster and identify from as far back as anybody knows up to the present if possible. If you would agree to take this on (don't hit me!) or would recruit some others among the alums in Lexington to help with it, maybe you could spread this out over a couple of years and ask for any and all photos of Lexington by decade, or maybe half-decades. We could all send them in via email or, if necessary, by actual photo. Then special TLCs could come out periodically with the photos and maybe requests for IDs that aren't included or known by the contributors. All this would culminate in a unique history of a small Missouri town - OURS - that will be invaluable in the future. Perhaps you could develop it into a book, written by you, and compensated by all of us granting you the income from the book. As an aside to this idea, Bessie Hackley '52 Hoeflicker made composites of hundreds of photos taken during her high school years. I don't know what happened to those photos (Ed: certainly important to the history of Lex). Personally, I have few pictures because although we had a Brownie Kodak camera, Mother wouldn't allow is to take pictures because it cost to have them developed and printed. Oh my. I suggest all this because I have great faith in you, Susan, and only you could pull off something like this, which would be an enormous gift not only to Lexington, but to all of us and many around the world, even to those who have never been to Lexington, Missouri or heard of it before. Wayne Tabb wrote: BTW, 1824 South Street, (referred to in #141) is where Carolyn VanCamp lived while she was in high school. The house is gone now. Nice note from Susan Comstock Robinson: I absolutely love reading about my hometown in the way that you present it! Gary Anton commented on Dennis Whitehead’s inquiry: I received this email from my Uncle Joe Anton, formerly of Lexington and currently in Sierra Vista, Arizona. My father, Alfred (Fred) Anton, lived in Lexington and was Joe’s older brother. Fred passed in 1997, shortly after he took his children (Cheryl Naylor, Sandy Crovo, Gary Anton and Steve Anton) to visit Lexington, his hometown. Unfortunately, we were in Lexington for the burial of George Anton--Joe and Fred’s older brother. In any event, it was the first time we visited Lexington. I thought someone had turned the calendar back 50 years. We visited the Anton Building—a shoe repair shop owned by my grandfather. We went upstairs to the living quarters and, lo and behold, the walls had the same wallpaper as when dad lived there. It was a most memorable family reunion with the whole Anton clan, from Florida, Hawaii, Arizona, South Carolina and, of course, Lexington. I write this as Fred (Freddy in his younger years) Anton is in the 8th picture down on the right side with Ned Barnet in front of the ice cream store. Fred’s last name is spelled Anton—not Antone—although it was pronounced An-tone. I don’t recognize anyone else or any of the places in the pictures. However, I had not previously seen that picture with dad. What a pleasant surprise! Thank you for turning time back with the pictures of dad’s old stomping grounds. I hope the book does well. Duncan Lee ’60, always a car enthusiast, remembered: The info about Rodekohr Motors reminded me of the car that Maurice Lee "Moose" Rodekohr drove while he was in high school. You may remember it (I certainly do!) a beautiful 1948 Plymouth Coupe, painted two-tone blue. He and his father had completely restored and rebuilt the car to better than new. It was the envy of every boy in school. You may think it's all too trivial to mention, but it was very important to us boys just starting to drive and dreaming of having a car like Moose. Another thought, while on the subject of car repair shops, is do you know anything about Effie LeJeune. At least I think that was his name. He either owned or worked in a car repair shop, and I strongly believe he owned his own. I also think that Loren LeJeune, with whom I graduated, was his son. They lived on Franklin between 14th and 15th I think, but it may have been 15th and 16th and few houses to the west of the Skelton house. I think it was the latter, because Loren, Jimmy Skelton and I used to play on the street in front of the houses. Geez, this memory thing is getting irritating. I feel certain someone out there will fill in the holes in Duncan’s memory. A surprise note from John Morrison (I think Class of ’47?) arrived: : Your TLC 141 was most interesting to me from several points. Ted Reed's merit badge card reminded me that in 1939, Ted, as a scout leader, took several scouts on a 14 mile hike ( at that time a requirement for the first class scout badge). Ted's dad drove a car-load of scouts to Higginsville and Ted hiked us back to Lexington on the old Higginsville road. As I recall we stopped at several farmhouses along the way for a cool drink. Most memorable was waving at a train and the train stopping to see if they could help in any way. Ted was a great leader and all made it back home without too many blisters. Another point of interest in TLC 141 was the mention of my older cousin, Robert (Bob) Morrison. As I recall, he and Shirley Russell battled it out for Valedictorian of their senior class. (I don't remember who won). Thanks for your epistles...they are fun, informative and bring back many good memories of a wonderful time in our hometown! I always get a kick hearing from Norma Homfeld ’50 Barney: I am far toooo young to remember any of these folks in the photographs. Ha… We lived on the farm, east of Lexington, and did not know many young folks until about 1946-47. I immediately thought you should ask Jim O/Malley and after reading further, you had heard from him. Thanks for all the work you do to put this out… I so much enjoy hearing about Lexington. Let me identify the folks in this picture. 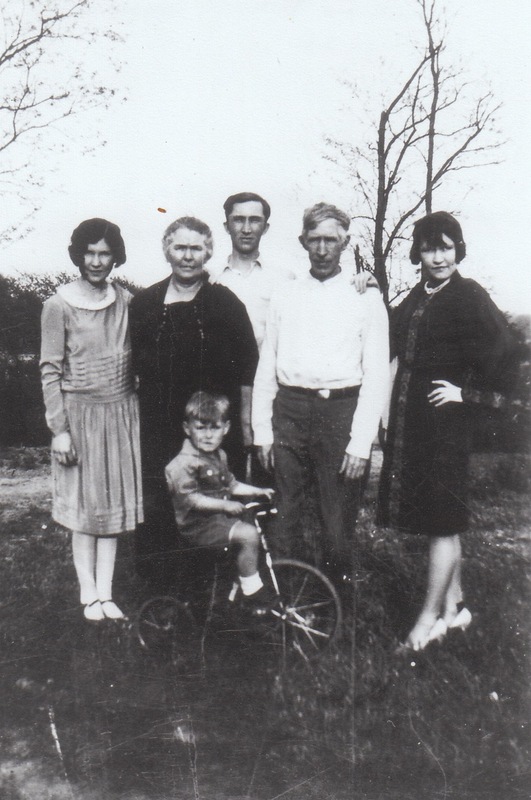 From the left, standing: Aunt Emma Catherine ("Ommie") O'Malley Lyons, Paternal Grandmother Bridget Boyle O'Malley, Father James ("Scoop") O'Malley, Grandfather Peter O'Malley, Aunt Margaret ("Daydee") O'Malley Buehlig. The little boy in front is Edward ("Eddie") Barlow. My grandparents would babysit Eddie for the Barlows from time to time. Eddie grew up and, during WWII, became an Army Air Corps photographer flying in B-29s. Back in the '60s or so he told me that he was in a B-29 and took a picture of Hiroshima the day before the Enola Gay dropped the A-Bomb on it. Eddie married, moved to St. Joseph, MO, and was involved with the grain business. He was a very intelligent fellow, fun to be with, and was a snappy dresser. His dad (Jack) had a feed store in Lexington, so I guess getting in the grain business was an easy move for him. And this is another one from Jim! 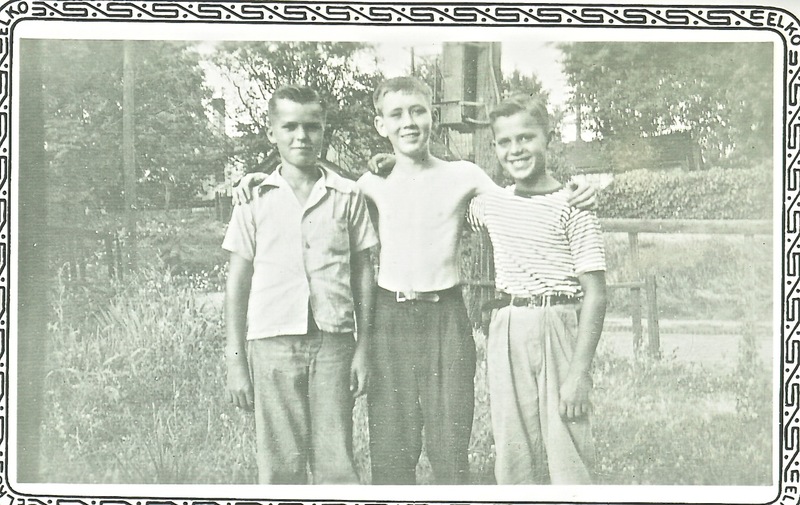 Here's a picture of the Schlueter brothers and me in 1943 (or thereabout). Duane and I were about 12 and Wally was a year or two younger. From left: Duane Schlueter, Jim O'Malley, and Wally Schlueter. Duane and I were '49 classmates at Lexington High School. When I was in the 9th grade Duane got me a job at the Advertiser-News as the clean-up boy after school. I made all of $3.00 a week. I felt like a millionaire! AND I have received another photo, a recent gathering of LHS classmates. Unfortunately, I cannot embed it. So I’ll send to Webmaster Bob Ball ’58 and ask him to put it on the TLC website. There is a prize for the first correct identification I receive (a year’s free subscription to TLC! J ). Those pictured and their relatives are ineligible to participate in the contest! Send more photos and stories – people love them! I will try to have a contest each month. This, by the way, serves as your February issue!